BBP’s Annual Impact Meeting & Free Pizza! Calling all BBP Members, Volunteers, and Supporters! Our Annual Impact meeting is this Wednesday, January 30th, 6pm at BBP. We need your help with something, actually two somethings, that are extremely important. 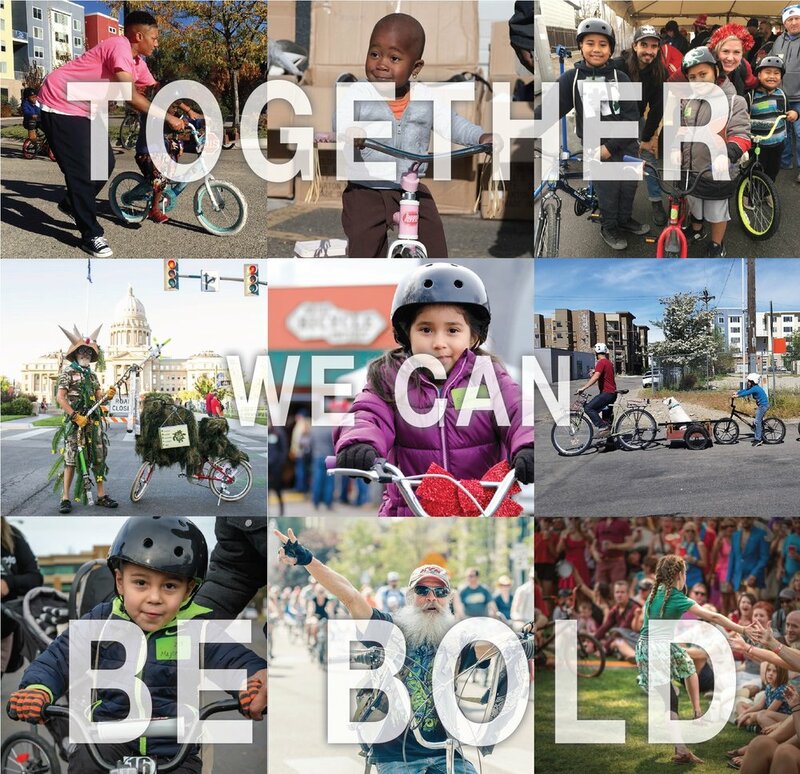 We’ve set bold goals for 2019, even bolder than usual, in effort to take massive steps forward in transforming Boise into a Bicycle Capital of America that serves all of its citizens. If we succeed in these massive steps, we could pedal right into a 2020 without limits. The Two Big Action Items! After free vegan pizza from Americana Pizza and short a presentation, we will break in six groups: three focused on creating a more inclusive, dynamic, and impactful Volunteer/BBP Orientation; and three focused on creating a more inclusive, educational, and engaging Member’s Night Experience. Since 2007, the Boise Bicycle Project has been hosting monthly or weekly Volunteer Orientations. Our goal has been to create an easy first step in getting involved with BBP’s impact. While our volunteer program is regularly praised for its ease of entry, we know we can do better when it comes to retention and inclusion. Specifically, we would like to see more women, youth, and people of color involved in our volunteer program, and we would like to increase the number of people returning to volunteer at least four times a year. 3 key ideas to enhance the fun, engagement, and effectiveness of BBP’s Volunteer Orientation experience. 3 key ideas to build more inclusion and diversity through Volunteer Orientation and the next two steps of engagement. 3 pie in the sky ideas that would make BBP’s Volunteer Orientation the best on the planet! Since 2009, the Boise Bicycle Project has hosted weekly Member’s Night classes, rides, and lectures in an effort to make the personal, social, and environmental benefits of bicycling accessible to our members. In 2017 BBP created a new BYOB (Bring Your Own Bike) curriculum to make it possible for members to learn about bicycle repair while getting to know/maintaining their own bicycles each week. 2018/2019 Member’s Night attendance has been inconsistent and seems to have lost some of the youthful energy that was so present in years past. We know we can get that energy back and use it to build a stronger educated and empowered membership team. 3 ideas to get BBP’s female and 16-30 year old members more engaged with weekly Member’s Nights. 3 pie in the sky ideas that would make BBP’s Member’s Nights the best on the planet! If you have two hours to spare on Wednesday, we could really use your help tackling these two big issues. By early Spring, we hope to put your ideas and input into effect!